Gobbledygeek episode 213, “Frog Lies and Rock Facts,” is available for listening or download right here, and on iTunes here. Two boys, lost in the woods. A fearsome beast roaming the forest. A frog with many names. Potatoes…and molasses. What do these things all have in common? They’re in Over the Garden Wall, the first-ever animated mini-series on Cartoon Network (and perhaps all of American television). The show, broken up in ten 11-minute installments, is a thing of weird and wild beauty. Paul and AJ discuss the many different references it draws from–Miyazaki, Adventure Time, Betty Boop–and how they all cohere to form one of the best cartoons in recent memory. 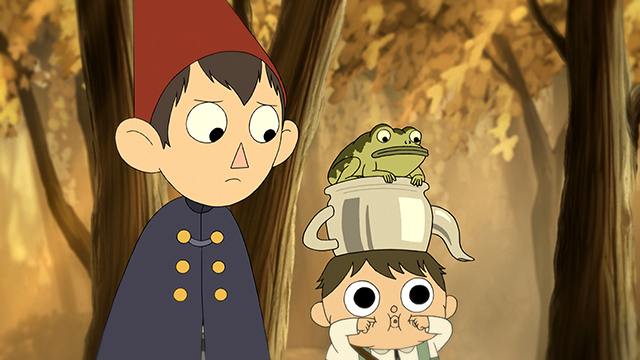 So why don’t you join them, over the garden wall? Plus, Paul has become an Avatar: The Last Airbender obsessive and AJ watched a whole bunch of movies during the Gobbledysleep. Next: Wesley “Wezzo” Mead makes his annual hop, skip, and a jump over the pond. This entry was posted in Shameless Self-Promotion and tagged adventure time, animation, avatar, avatar the last airbender, betty boop, cartoon network, cartoons, comedy, fantasy, film, gobbledygeek, hayao miyazaki, itunes, libsyn, movies, musical, over the garden wall, patrick mchale, podcast, television, tv. Bookmark the permalink.